Knowing where you belong is a feeling that Nikko Andre can connect with on the baseball field and in life. The uncommitted 2020 catcher has played behind the plate since he was 6 years old and he knows he belongs behind the plate. From handling a pitching staff to directing the defense, and of course shutting down the running game with his 1.9-2.0 POP time the junior is right at home behind the dish. And he’s sure to also be finding that same feeling soon when it comes to a fit for a college program. For now, he belongs to the St. James Sharks out of Murrells Inlet, SC, who are coming off a 2018 season that saw them run out a 28-5 record. Of course, Andre and his teammates have high expectations for 2019 as they have recently started to play. He said the scrimmages were an opportunity to jell and communicate. And that’s a big deal because after having 10 seniors on last year’s team the Sharks will have to come together quickly, which is something Nikko has seen already this spring. At 5’10” and 180 lbs., Andre brings some athletic and physical tools to the table. He describes himself offensively as having the ability to work the count and delivery with confidence. He considers his approach one that puts pressure on the pitcher to locate because he can attack or extend the at-bat and run the count to his advantage. This past off-season the focus has been to really work on his swing with the likes of Dirtbags SC Director Brendan Dougherty. According to Nikko he really has been able to work towards “making the swing mine,” after previously has trying to emulate other people’s techniques and philosophies. 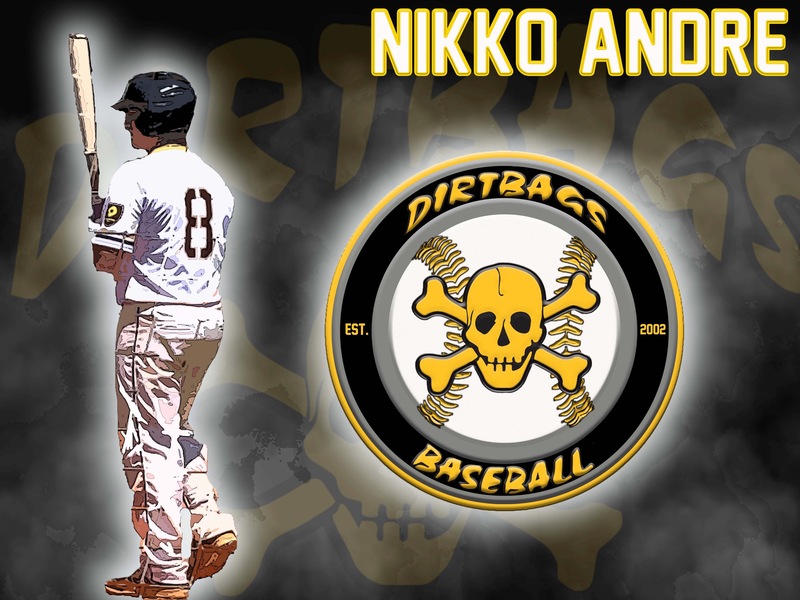 The chance to improve by working with quality coaches like Dougherty is just one reason that Andre attributes joining the Dirtbags 2 years ago as the right move. The program seemed to be to be a perfect fit, as he took input from former St. James teammate and Dirtbag Jacob English. Ultimately, the decision came down to having the opportunity to play nd with the best and WIN. That brings the conversation to the 2019 expectations with the Dirtbags. After playing with the SC Callihan and Conner teams he feels his squad of Bags has some top arms and a lineup 1-9 that can swing it. Nikko said they are ready to make the next step after a few good showings in national events last year, as evidenced by his own 4-for-4 showing in one game in Atlanta for the first time. So where does he belong at the next level? Wherever he can compete with the best of the best and he’s grateful the Dirtbags are prepping for that chance. He is confident he will know that place where he belongs when he finds it.